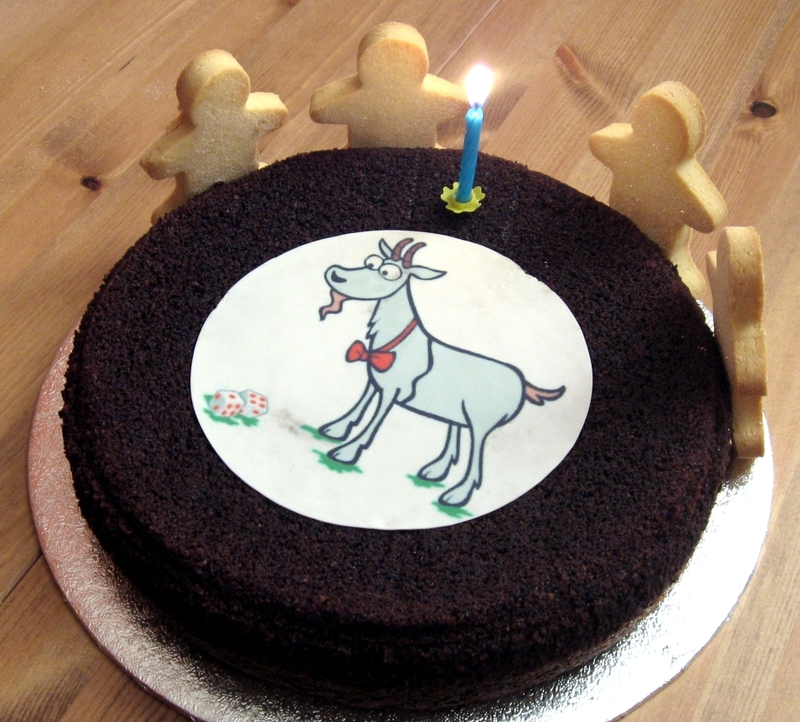 As our first birthday is on October 2nd, we decided to make the evening a little bit of a celebration of the year. The first game we played was our “Feature Game”, which this week was the most popular game that hasn’t been a “Feature Game” and that is Dobble. So we started out with a couple of quick rounds while we waited for people to arrive. Next up we decided to play another relatively light and quick game, Indigo. This is a really pretty abstract game, that is extremely easy to teach. Basically, you have a hand of a single hexagonal tile, and on your turn you play it anywhere on the board that does not already have a tile. If your tile has a extends the route of one of the coloured glass stones, you move that stone along the path. The aim of the game is to navigate as many of the stones to your gates. The clever part is that gates can be owned by one or two people depending on the number of players, so there is a nice interplay between helping yourself and teamwork. The stones are also worth different numbers of points, so you need to balance the compromise between value and quantity. The game was quite tight, however, Red managed to extend her unbeaten run with a draw with White. …And that was Stimmt So! 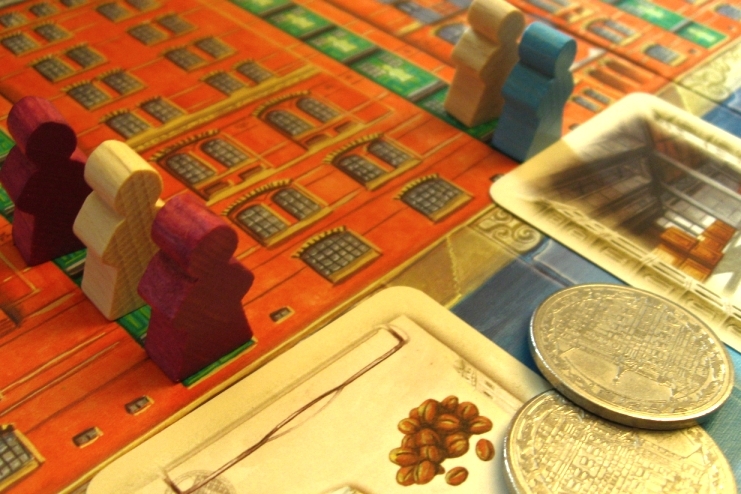 This is a game that we’ve been on the brink of playing many times, but with the same basic mechanism as Alhambra, we’ve always ended up playing that instead. Basically, on their turn, players can do one of two things: buy shares, or collect money. Shares can only be bought in the correct currency, however, and if players pay for them with exactly the right amount of money they get another turn otherwise they don’t get any change. There are two scoring opportunities during the game, and one at the end, and players score for having the most shares in each market. Blue was too busy shuffling to pay much attention to the rules, so started out just buying everything she could. Meanwhile, Red and Green tried to carve out a strong position in the most lucrative companies. At the first scoring round, Green lost out to Red and Blue (who had by now realised what she was supposed to be doing) held her own with a large number of holdings in the less valuable stocks. By the second scoring Green was still struggling and the situation only got worse in the final round. Points are given for the lowest value companies first where Blue had the majority and she romped ahead with Green picking up some of the second place points. As the more lucrative shares were counted Red galloped round the board, but somehow Blue just maintained her lead. The final game of the evening was an old favourite that we’ve played a few times before: Die Speicherstadt. This is a really fun auction game, that somehow doesn’t really feel like an auction game. A number of cards are placed on the board and players have three meeples to bid with. They take it in turns to choose which cards they would like to buy, by placing their meeples in rows above the cards they want. The person who who placed their meeple above a card first gets the first refusal, however, it costs the same number of coins as there are meeples above the card. Thus, placing first can be a good thing if you have enough money to back it up, but money is very scarce. 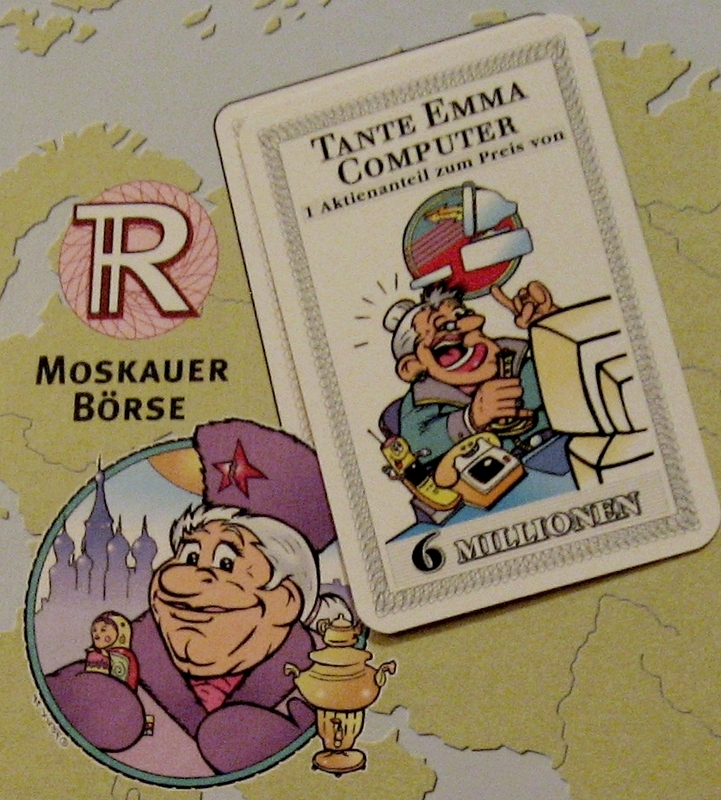 The cards could be contracts (that give points at the end if fulfilled), ships containing goods (that enable players to fulfil contracts), firemen (which help score points if there is a fire in the warehouse), merchants (which can sell goods for a better price), or buildings (which give points or occasionally money by some other means). Blue made a pretty poor fist of it right from the word go paying far too much for the warehouse despite the fact that she had picked up a load of merchant cards in the first round. White was very late getting contracts, but lost out in a scrap with Purple for firemen cards. Purple ran out the clear winner with four fulfilled contracts to add to his fire points giving a total of 39 points – almost falling off the end of the scoring track! White and Blue tied for second, but some way behind. We ended the evening with a little chat about the Spiel at Essen which some of us are thinking of going to this year, oh, and of course, some more of the really rather tasty cake! Learning Outcome: There is only one thing as bad as not going for firemen, and that’s going for firemen and losing. This entry was posted in Games Night and tagged Alhambra, Dobble, Indigo, Stimmt So!, The Speicherstadt on October 3, 2013 by nannyGOAT.